The 13-year-old girl was kidnapped from her family's home in Barron, Wisconsin, on Oct. 15 and managed to escape 88 days later. 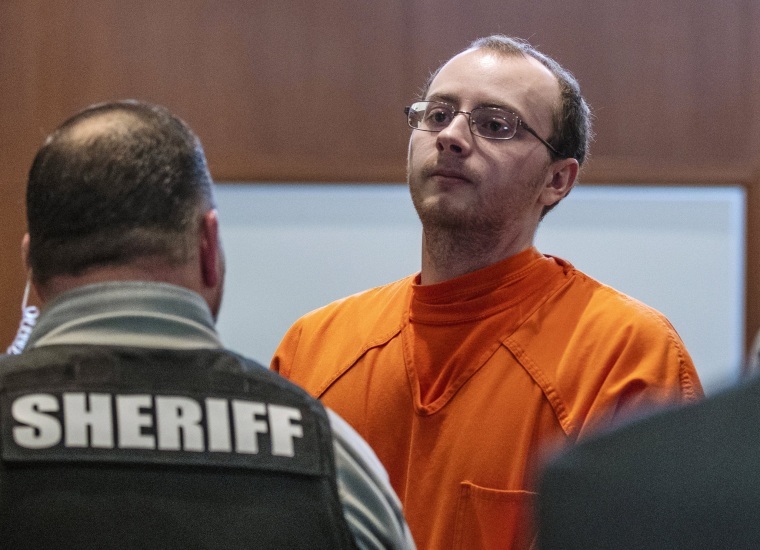 The Wisconsin man charged with kidnapping 13-year-old Jayme Closs and murdering her parents in October cried in court as he pleaded guilty Wednesday. Jake Thomas Patterson, 21, was charged in January with two counts of first-degree intentional homicide for the shooting deaths of James Closs, 56, and his wife, Denise, 46, as well as one count of kidnapping. Authorities said they believe Patterson targeted Jayme, who was found alive 88 days after she vanished, and did not know the teenager prior to abducting her from her family's home in Barron, Wisconsin, on Oct. 15. Patterson, dressed in an orange jumpsuit, appeared in a Barron County Court on Wednesday afternoon and answered "yes" to a judge asking him if he wanted to plead guilty. As the judge read the charges, Patterson cried as he said he was guilty. Several of Jayme's family members, including her guardians Bob and Jen Smith, were present in court and were seen wiping away tears as the charges were read. "Mr. Patterson has wanted to enter a plea since the day we met him," his attorney said. "He has always been consistent in his statements and belief that this is what he wants to do." Patterson's lawyers asked the court to dismiss a fourth count of armed burglary, which the judge agreed to toss out. Before Patterson walked out of the room, he turned to the cameras and said, "bye, Jayme." Several of Jayme's relatives gasped in disbelief. Jayme was found in January after escaping Patterson's home in Douglas County, Wisconsin, about an hour north of where she lived. She emerged from the woods and asked a woman named Jeanne Nutter, who was out walking her dog, for help. Nutter went to the home of her neighbors, Kristin and Peter Kasinskas, who then called 911. Jayme has since been reunited with her family. In February, the teenager and her family released a statement to the Associated Press saying the support she has received from everyone has "been a source of great comfort to her." Earlier this month, Patterson sent a letter to NBC News affiliate KARE apologizing and revealing his plans to enter a guilty plea so Jayme and her family would not have "to worry about a trial." He also called a reporter with WCCO saying that he loved Jayme and detailed how they watched television, played games and "cooked a lot" during the almost three months he held her captive. "The reason I did this is complicated," Patterson wrote to KARE reporter Lou Raguse, who had sent him questions about the kidnapping. "No one will believe or can even imagine how sorry I am for hurting Jayme this much. Can’t express it." The outlet reported that Charles Glynn, Patterson's lawyer, would not confirm or deny the letter and said he had not talked to his client about it. When asked about his motivation behind the kidnapping, Patterson responded that it was "not black and white." "The cops say I planned this thoroughly, and that I said that," he wrote. "They’re really good at twisting your words around, put them in different spots, straight up lie. Little mad about that. Trying to cover up their mistakes I guess. This was mostly on impulse. I don’t think like a serial killer." Patterson faces a maximum sentence of life in prison for murder and 40 years for kidnapping, the judge said.